Real Warrior Women or Ancient Myth? 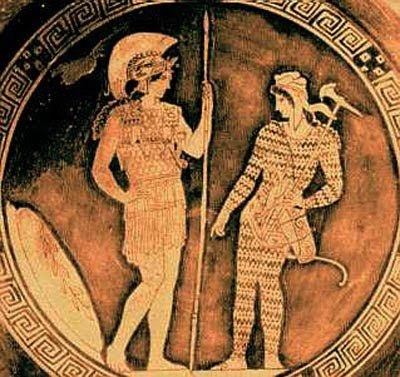 According to Greek mythology, the Amazons were descendants of the god of war, Ares, and the sea nymph, Harmonia. They worshipped Artemis, goddess of the hunt. Herodotus believed they may have occupied the sweeping steppes of Southern Russia. Other stories claim they lived in Thrace or along the lower Caucasus Mountains in northern Albania. The Thermodon River, in Asia Minor, known today as the coast of Turkey, seems to be the most frequently mentioned territory of the Amazons. Interlocutor: Let’s move on to another completely different topic, Did “the Amazons” exist? Ruanel: Yes, they existed. It was a tribe of independent women. Interlocutor: Is it true the legend that says that they had their breast cut off so that so they would be able to use a bow more freely and throw spears without physical limitation and obstruction? Ruanel: No, absolutely not. They only pressed the breast so that it didn’t bother them when they were using the bow. Interlocutor: In what place they lived and how long ago they disappeared? Ruanel: They lived for a thousand years in all the forest areas of Greece, and rarely were they seen along the cliffs or by the sea coast. Interlocutor: Is it true that they used to take male prisoners and kill them after using them to procreate? Ruanel: Yes, but they killed them mainly so that they didn’t reveal their hiding-place. Interlocutor: Did they have phobia about men? Ruanel: No, what happened was that they did not accept male supremacy. They considered men weaker than women. Interlocutor: Were they a very big tribe? Ruanel: They reached the number of two thousand. Interlocutor: Is there something more to say about this topic? This entry was posted at Tuesday, August 17, 2010 and is filed under History . You can follow any responses to this entry through the .